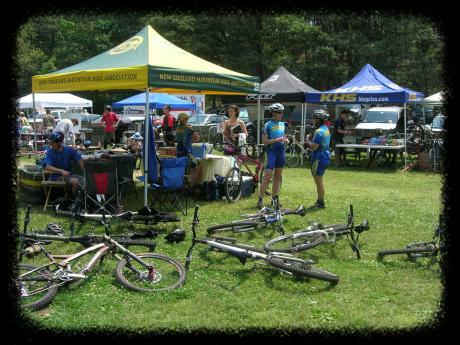 The 2nd annual D-Day Mountain Bike Event was another complete success! 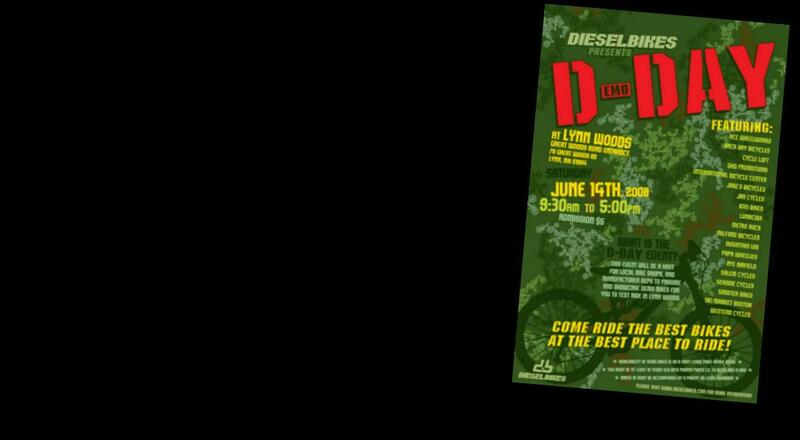 On Saturday June 14th, Dieselbikes was proud to promote and host a single DEMO mountain bike day event in Lynn Woods (Lynn, MA) titled "D-Day The Second Drop". This year we were happy to have warm sunny weather that helped with the festivities and made the event much more enjoyable for all. The event went off without any major hitches, however we did have a few schedule modifications based upon some last minute changes. 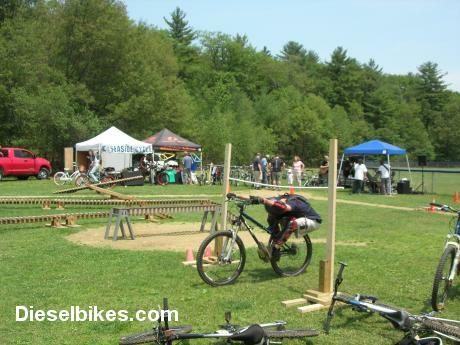 This year was host to 18 vendors and 4 manufactures showcasing 2008 and 2007 DEMO bikes for event attendees to ride. With over 65+ DEMO bikes available to test ride, event attendees did not have a limited selection of bikes to choose from. There were a number of lightweight XC models to full suspension all mountain and downhill rigs available. 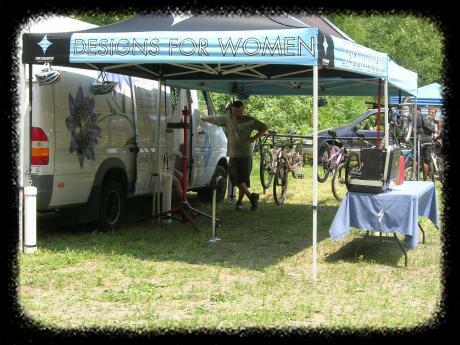 We were limited on a few different DEMO bikes such as 29ers and a number of Downhill rigs were not allowed in the woods, but in general we believe everyone was happy with the bikes that were available. In addition to DEMO bikes, a number of sponsors offered riding and maintenance clinics to assist attendees in making the most of their DEMO ride. Set up of a DEMO bike to a specific rider is a difficult venture to accomplish, since the set up is limited to the bikes current build kit, but all the sponsors made their best efforts to assist any request they received. Sponsors were also available to answer technical questions regarding specific bike designs, comparison of models and availability for inquiring minds. One highlight of this year�s event was the addition of some women specific venues sponsored by The Boston LunaChix and Specialized Bicycles. The LunaChix and Specialized were a perfect combination to run this venue and they got the job done! The LunaChix were in full force with Jimena Florit (4 x NORBA Champion XC and Short Track, Pan-American Gold medalist) leading women group rides, technical riding clinics and helping out with bike set up. With the LunaChix in the drive seat, Specialized Bicycles was providing the wheel power offering a number of women specific DEMO mountain bikes. These women specific bikes are designed with geometry for women by women and are helping attract more females into the sport of mountain biking. Both of these sponsors were busy throughout the day and we received great reviews for their efforts. There were a number of group rides held during this year�s event ranging from short 15 minute DEMO rides to 90-minute tours of Lynn Woods. Although we had more ride leaders and additional sponsors holding their own group rides, we did fall short this year with pre-ride announcement/scheduling, but plan on addressing this matter during our next event. Regardless of this small technicality, everyone who went out on group rides during the event came back with a BIG smile! Some attendees rode Lynn Woods for the first time and a number hit the new trails that have been built over the last two years. From beginner to expert technical rides, our ride leaders had it covered and they were enjoying every minute out on the trails. Once again, mountain bikes were not the only wheeled vehicles to DEMO ride. Mountain-Uni was in attendance providing short classes on how to ride a unicycle. For those who knew how to ride a unicycle, Mountain-Uni also provided more technical clinics, having rides navigate trail obstacles. On hand to Demo was a Trials Unicycle, Freeride and XC 29" for attendees to ride and play around in the skills area. Just as last year, Mountain-Uni drew a number of attendees interested in trying out the sport of mountain-uni as well having a number of spectators when Jeff and his team was out riding the wooden skills area. 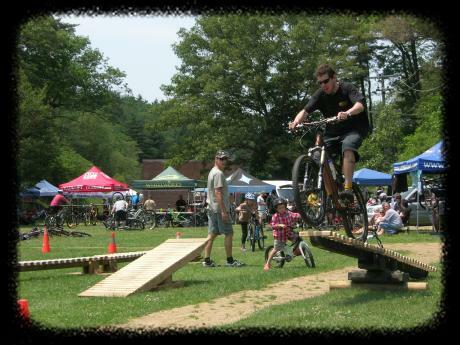 This year Dieselbikes expanded our wooden stunt skills area offering a number of new stunts for attendees to try out. One big wooden feature added was the introduction of the CANNON. The CANNON is our portable 12-foot by 12-inch wide teeter-totter that was enjoyed by all that attempted to overcome its intimidating stature. Also on hand were a number of skinny ladder bridges of varying widths, a 2-foot elevated deck jump and small beginner teeter-totter that was a blast for our kid attendees. Over on the sidelines, we held our first Mountain Bike Limbo Contest that was broken into two separate groups. The first group was small bikes under 20" and mostly consisted of kids just having fun. Among the little riders were some adults trying to squeeze their way under the limbo stick riding tiny kids bikes�it was a sight to see. The larger class was bikes over 24" and this was a dual that ended in a draw between to riders. Both rides were able to squeeze under 46" but not able to go any lower. The Limbo contest was a fun time for all and we have been requested to hold more fun competitive games in future events. Our music venue was once again directed by Chris Keating Productions and featured musicians such as "Status Whoa", "Qwill" and "Scott Void Radio". We also saw the return of "Walnut - da lyrical geni" who preformed a number of funk hip-hop tracks. The support from these local musicians groups added another level of karma to this event. The genre of music ranged from bluegrass, funk, hip-hop, to rock. Again, we want to thank all the bands and the efforts of Chris Keating Productions. If you want to know more about these bands, you can contact them through Chris Keating Productions (chriskeating@chriskeatingmusic.com). Last but not least, we have to give a big shout of THANKS for all our support members, volunteers and sponsors that help make this event possible. First on the list, we want to thank our event volunteers who took time from their own busy lives and helped support our event. With out them, this event would not have functioned so smoothly. Second we want to thank our club members that stepped up to the challenge handling every aspect of the event with no issues or problems to report. Third, we want to thank all of our sponsors who spent the time and money to come out and support this event. With out their business support, generous swag and on-site personnel, this event would not have been any bigger then the year before. We also would like to thank Dan Small (Lynn Woods Ranger) and the City of Lynn for their trust and confidence in Dieselbikes abilities to hold such an event. Without their permit approval, this event would have not taken place. The stats for this year�s event were bigger and better then last year. Our attendance had a 15% increase over last year's 2007 D-Day Event, but over 50% increase for money generated for Lynn Woods and the park ranger fund. In our eyes, this was a complete success and big win for the trail network in Lynn Woods. Regardless of these increases, we will work to make our next event(s) bigger and better adding more venues, clinics, group rides and contests. 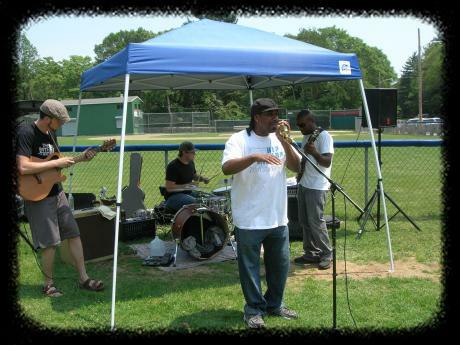 We look forward promoting future events in Lynn Woods and hope to see everyone at next years 2009 D-Day Festival! Superman Jay just showing up to help out! What was the "D-Day" Event? The "D-Day" event is a huge mountain biking social event that allows event attendees to DEMO mountain bikes on lead group rides in Lynn Woods. Our goal is to provide a method for mountain bikers to test ride mountain bikes they are thinking of purchasing on singletrack. In addition, riders can compare the performance characteristics of each DEMO bike they ride and speak with attending manufacturers and/or factory representatives regarding these DEMO bikes. This event will also provide attendees with technical information about bike maintenance, local/regional trail maintenance activities/programs along with riding clinics performed by local riders. How did this Event Work? This is a one-day event (June 14th) for mountain bikers of all levels to test ride DEMO mountain bikes. Event attendees will be lead on group rides through a pre-determined trail by Dieselbikes� club members. Lead DEMO group rides will last about 15-20 minutes allowing the user to try out the bikes. The number of group rides and length of time in the woods will be adjusted depending on quantity of available DEMO bikes and number of event attendees. Secondary events such as skill clinics, non-demo group rides, balance beam playground and exhibition shows will be held on and around the main event field. This event is for all levels of riders and have venues for family members. What is the Reason for this Event? This event provides a method to help generate money and awareness for Lynn Woods Reservation. Money collected by attendee/sponsor donations and/or through the event raffle contributes to the Park Ranger Fund. 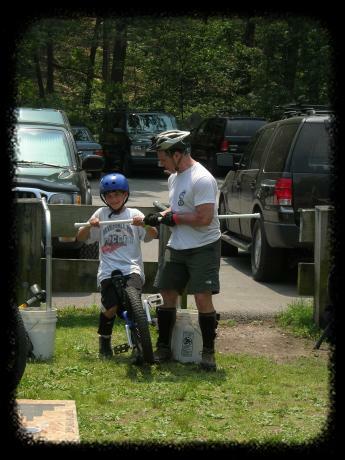 This fund helps maintain Lynn Woods and support Dieselbikes� trail efforts there. Additional, this event provides a method for the bike community to ride new and different mountain bikes on trails, which generally such an opportunity does not exist. Date: Saturday June 14th (In the event of sever rain/stormed, make up day is scheduled for the following Sunday June 15th). Location: Lynn Woods Great Woods Entrance. Click here for directions. Event Time: Begins at 9:30am and runs until 5:00pm. Event Admission: $5.00 - Includes 1 Raffle Ticket and Event Insurance. CASH Event: Dieselbikes and/or event sponsors will not have the ability to accept credit cards or debit cards at this time. We can accept CASH and Personal Checks as a method of payment. We apologize for any inconveniency this may cause. Event Wavier Forms: All attendees are required to sign event wavier forms prior to entering into this event. Under 18 must be signed/accompanied by a parent with proper photo ID. USE OF DEMO BIKES: Each sponsor will have requirements for proper photo ID and completing waiver forms before riding any demo bike. Riders under the age of 18 must be accompanied by a parent with proper photo ID. Availability of demo bike is on a first come first serve basis. Dieselbikes Group Rides: Group rides will happen throughout the event. Ride leaders and riding levels will be posted during the event.